The Michaels Companies of Irving, Texas, is recalling about 110,000 Creatology Spin Art Kits. The firm has received two reports of battery compartments overheating in the spin art kits. No injuries have been reported. This recall involves spin art kits sold under the Michaels private brand Creatology. The 34-piece kit includes one battery operated spin art wheel with cover, paint, paint brushes, and paper. The recalled art kits are blue and have SKU number 197861 and one of the following UPC codes printed on the barcode the box. 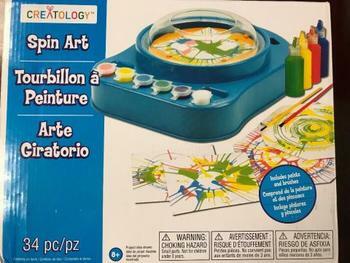 The spin art kits, manufactured in China, were sold exclusively at Michaels stores nationwide and online at www.michaels.com from August 2011, through February 2018, for about $25.